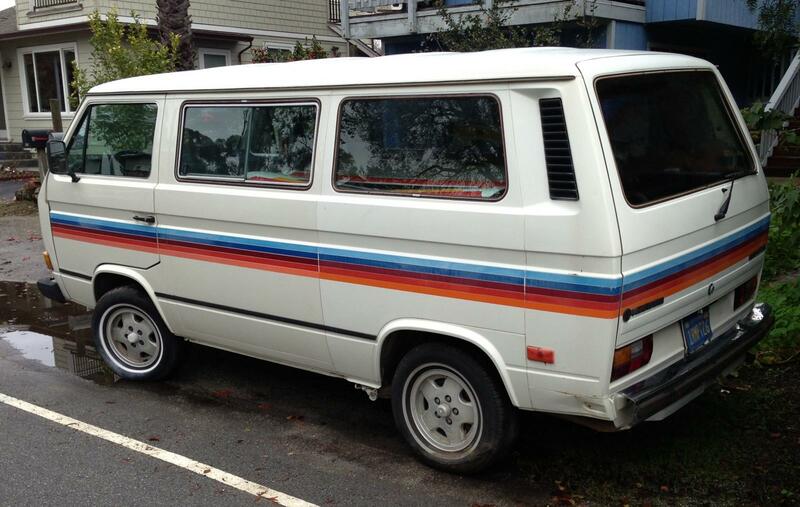 Posted: Sun Mar 17, 2013 10:28 pm Post subject: 1986 Hobie Vanagon sitting for 11 years. Time to make run. 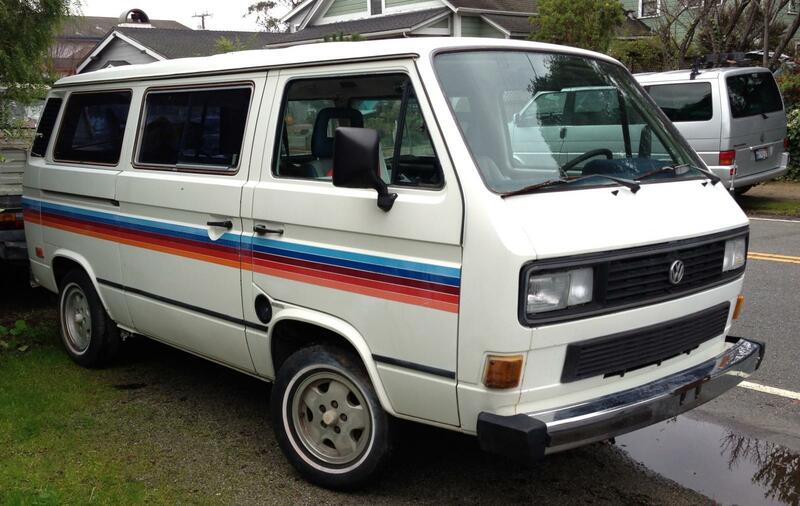 I recently purchased an '86 Hobie Vanagon from the widow of the original owner. He'd parked it 11 years ago to replace the water pump. (I'm guessing. His friends said it was leaking coolant and I found a new waterpump in a box in the Van) So He parked it to do a waterpump then the owner died. Van sat for 11 years untouched. It's in remarkably good shape. Here's the problem/question. It's been sitting so long that while it smells horrible of old fuel there was maybe 1/2 a cup of fuel in the tank. Could have been water but I don't think so. So what to do? Replace entire fuel system? Put fresh fuel in it and try to start it? Or something in between perhaps? What about gear oil and coolant system? I don't want to spend a ton only to find out it has a rod knock or junk trans or anything else major. Sitting in Colorado it's unlikely to have much if any rust in the tank. I'd change the fluids, plugs etc, turn the motor over by hand a few times then she if it will start! You can start off by using a secondary auxiliary fuel source to see if it runs. Then if it does flush out the old tank/lines, put a good filter inline and run it. Does it still have the windsurfer that came with it? Where in Colorado are you? I'd put some Marvel Mystery Oil in the cylinders and let it sit for a few days first in case the there is rust around the rings to the cylinder walls. Anyways, I'm sure others with more experience will pipe in. John - 86 Wolfsburg Westfalia "Weekender"
Post up some pictures please! I suggest getting the engine running, but then getting the brakes fixed before trying to test drive it! Stopping is an important quality. "Along with the ability to go fast, one looses the desire to hurry." Duh. I should have changed my profile. I am now in Santa Cruz, CA. The Vanagon is in remarkable shape with one small patch of rust. Easy fix. It was in San Jose, CA and dry. No fog or salt air. Tank didn't seem to have any rust at all when the line was pulled. Missing the windsurf board. Going to keep it as a driver. Will likely sell my 84. What was the story with these Hobie vans? Fancy stripes and decals? Did it really come with a windsurf board? What years? Pictures or it ain't real! 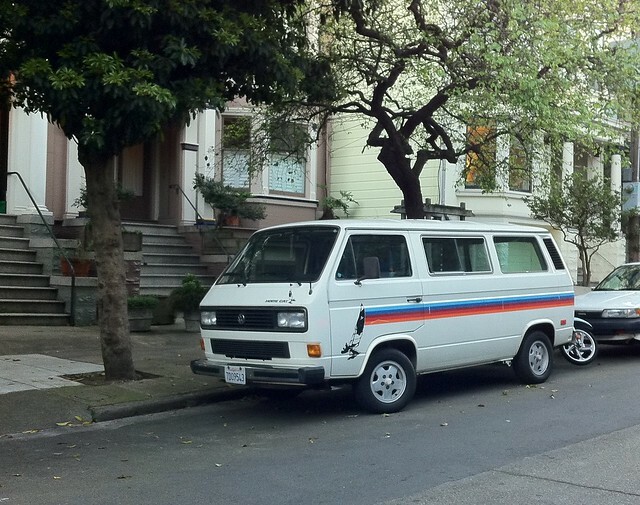 "Use the SEARCH, Luke" But first visit the Vanagon FAQ! 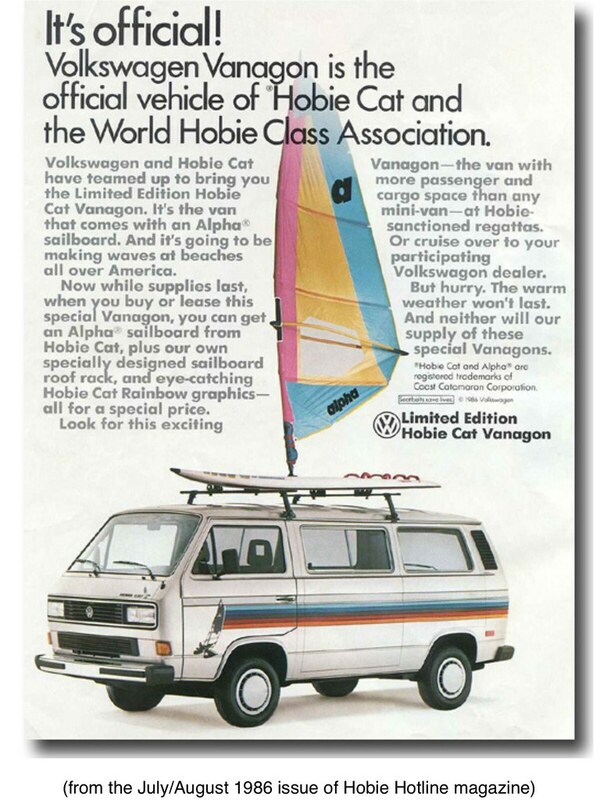 I tried to buy one of these Hobie Cat package Vanagons once. The van had been turned into an ice cream truck and he had stuck ice cream decals all over the outside of the van. He ended up ruining the Hobie Cat graphics when he pulled off the decals, so I passed on it. It's cool that you are resurrecting on of these rare special editions. Although, with today's computerized graphic decal companies scattered about in many towns, making replacement decals is actually a fairly "simple" process. That photo posted could be the basis for a new set, that is after a bit of figuring and scaling took place. Hey David, have you seen the Wolfram Gray one that is owned by that lady here in Redmond? She lives just down the road from me. I haven't seen it up close, only driving by. The graphics look to be intact for the most part. Old gasoline contains high levels of varnish. Varnish from this source is so sticky that it can actually make your intake valves stick open! The fuel injectors are aimed at the intake valves, so this can happen pretty quickly. I suggest that you remove the fuel return line, connect to a waste canister, and run the fuel pump to empty the old fuel out. Then add a gallon or so of new gas and repeat. This will flush out most of the old gas. The varnish remaining in the tank will be a work in progress. Seafoam or Marvel Mystery Oil can help with that. The rest of the fluids (esp coolant) should also be replaced, but clearing out the bad gas is very important. clearing out the bad gas is very important. Disconnect the line before and after the fuel pump and get as much out as you can, try removing varnish from the fuel pump if you can. Swap out the fuel filter with a new one, take care of getting proper fuel lines and the plastic fitting through the firewall. Brakes are always gone through first on any car that I get. Once you get it running strip and repack the CVs and wheel bearings to keep everything rolling nicely. Changing out the gear oil is a good idea so that you can check for coloration to indicate issues. No. I haven't seen it. It sounds interesting. I had thought they were all Pastel White. I didn't know they came in Wolfram Gray. I found a white Syncro one on Autotrader.com about 8 years ago which I was intrigued by because I thought they were only on 2wd vans. I'm starting to wonder if the Hobie Cat package was just sent to dealers and they put it on whichever vans they wanted to. I've missed seeing you at the local VW/Vanagon gatherings. Hope to catch up with you soon. I didn't realize digital graphics had advanced to the point where they could be reproduced from a photo. That's cool to hear, Dave. Lots of cool reproduction possibilities. Found with New german rear bumper inside and a water pump. A few other thigs as well. Interior is nicer than the exterior.